Natural treatments for ADHD and Autism continue to be controversial. According to the CDC 11% of children in the US between the ages of 4-17 have diagnosable ADHD. With all of these numbers staring us right in the face you would think that we as parents would know more about these disorders. I have ADHD so I should get it, right? But I don’t always get it. I have had to try and fail and read sooooo many books. Crying didn’t get me anywhere. Asking myself “why my kid?” didn’t either. I remember when my son was a few weeks old. I noticed that he absolutely could not be put down. Every time I laid him down to change him, or just to use the bathroom he would shriek in the most horrible high-pitched tone. Screaming was an endurance sport for my son. One day I decided to put him in the stroller and walk around the local Penn State campus. He screamed for the entire 45 minutes. When I got home I looked in at him and he had scratched himself until he was bleeding. Feeling guilty, I vowed to never let him get that upset again. I became accustom to swaddling him in a Moby Wrap or the Baby Bjorn. E spent the entire first year of his life attached to either me or my husband. My baby had to be pressed up against another human in order to stay calm. It was the first of many signs that led to an official diagnosis in 2017. The little guy goes to social skills club and OT every week to work on his sensory issues. 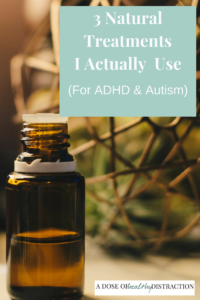 At home we have tried to incorporate some natural treatments for ADHD and Autism. After much trial and error, we have found that some of the natural treatments actually work. In January of 2016 I started to casually experiment with essential oils. My son (hopefully) benefits from my ongoing experimentation. My son is exposed to essential oils all the time, I honestly cannot tell if it impacts his behavior or not. I figure every little bit helps. We struggle with emotional regulation and staying calm around here so I choose my oils based on that. For example, I like the oils at night when we are all sleeping. My husband is partial to DoTerra’s Balance oil, so I buy that to diffuse. I like DoTerra’s On Guard and Breathe as well. I have no idea if they increase our immune function, but I like them both. Please note, I am not associated in any way with DoTerra – I simply buy a few of their oils. Using oils during the day is still experimental for me. I am currently enjoying Attention Assist from Rocky Mountain Oils during the day. I also use Rosewood from Rocky Mountain Oils because I like the smell. I kinda wish there was a way to test out if the oils would help my son in school, but I have no way to accomplish that. Link to Rocky Mountain Oils – Not an affiliate here either. Bottom line: Essential oils are good for some things but they are by no means a cure-all. A few months back my son’s occupational therapist showed me that he was much better able to do puzzles and other work when he was receiving some sensory input. Over time we started to notice a pattern with him. Basically, if he gets the right amount of input he is more compliant and his mood is better. Which makes sense when you consider his screaming for the first year of his life. Making him a hamburger between two couch cushions while I lay on top. Rolling him up tightly in a blanket like a burrito. Using “jackhammer” pressure on his large joints. Lightly karate chopping or doing “spa things” as he calls them all over his body. Head and scalp massage before school. I was looking for a weighted lap pad for my son to use at home and possibly at school. 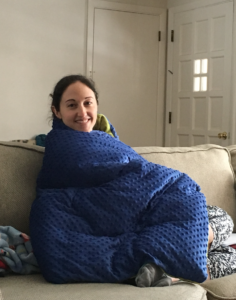 Harkla actually sent me a whole weighted blanket! I am obsessed, so now we fight over it. I have to admit when the OT first mentioned weighted items I was skeptical. But it really works to ease anxiety and promote feelings of calm. On the subject of calm, these hug t-shirts are also a hot commodity in my house. In fact, I have long and short-sleeved versions in almost every color. 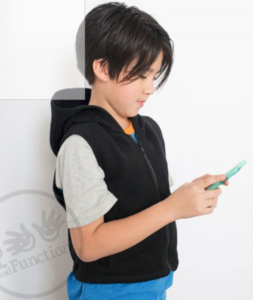 Here is a weighted hoodie I bought for him to wear when he needs it in class. I am a big fan of Fun and Function, but I am not an affiliate. I have been trying out some supplements as well. OPCs. I have to admit I do not completely understand how these work, but I figure it can’t hurt anything. I use Isotonix brand OPC -3 because I get it in my chiropractor’s office. In addition to the above, my son does take a multivitamin and I have cut back drastically on his dairy intake after reading a bit about that. We are not gluten free but I have thoughts of trying it out at some point. When you have a child that is struggling you are willing to try just about anything, from family therapy to integrative medicine. 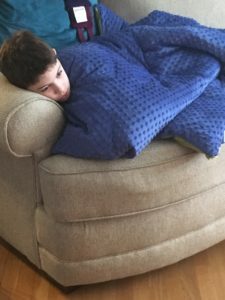 Parenting a child with high functioning autism and ADHD is not for the faint of heart. Sometimes you are really throwing spaghetti at the wall. Some of it sticks and some of it splashes back on you!